Sadie 16's Story . . .
Sadie became a MAESSR lady when her New Jersey owners realized that this high-energy girl needed more attention than they could give. Both adults were working outside of the home and their children had moved off to their own pursuits. MAESSR was asked to find Sadie a home life more suitable for this sweet girl’s needs. 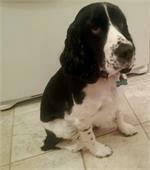 Reportedly Sadie has never shown any signs of aggression and is good with people including children and toddlers. She has shown some curiosity towards kids, then ignores them. She lived with a Yorkie and a dog savvy, de-clawed cat. 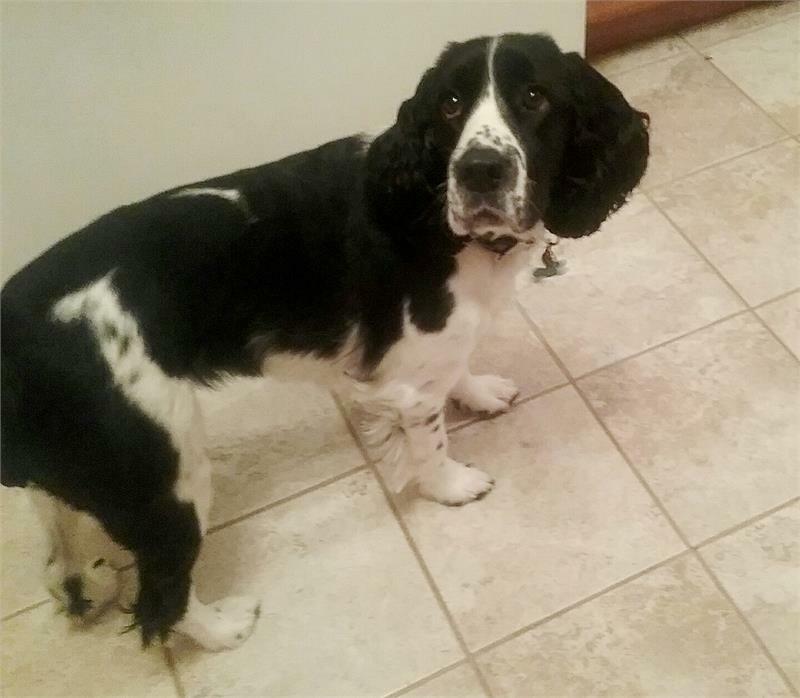 Moving into her foster home, Sadie warmed up to her Springer brother within minutes after a little nervousness from all of his attention. Since then they have spent many a day wrestling and chasing each other around the house and yard. This girl loves, loves, loves to run around the backyard and be outside. Her tail goes a mile a minute the whole time she is in the fresh air. Sadie is particularly fond of taking her toys out with her. She likes to play fetch with anything and will bring it back and drop it. Sadie has a really strong prey drive and likes to stand on her back legs to try to get a better gander at all of the squirrels and birds in the trees at her foster home. Her foster parents learned that Sadie has trained bird dogs in her background. That is definitely apparent when watching Sadie in action outside. She will play until she is tuckered out and then she will settle down for a quick nap…until someone asks if she wants to go outside. Then she is ready to go again. Sadie has never been swimming. In her down times, she can be a real cuddle bug and big kisser! Sadie has had no formal obedience training but knows “sit,” “stay,” “come,” “off,” and “rollover.” Her recall seems spot on but it has never been tested outside of a fenced in area. Crate trained, Sadie previously slept in her crate at night and was crated while her former family was at work. She complained a little when she was crated during the day, but quickly settled down. She was eager to get out of her crate at the end of the day. In her foster home Sadie sleeps in a dog bed beside the human big bed. Occasionally she will try to get up with her people but gets down immediately when told “off.” Now and again she does try to hop up when everyone is sleeping, hoping she wouldn’t be found out. Can’t fault a girl for trying! Sadie will pull a little on leash mostly due her excitement to see everything and anything. A harness or gentle leader might just be the ticket for a smoother walk. She loves to ride in the car and settles right down to take a nap the moment the car is put in drive. She remains that way until she has reached her destination. On a recent trip to a pet store to purchase dog food, Sadie was well behaved and did not react to any of the dogs there, although she never got up close and personal. Sadie can be startled by loud noises but recovers quickly. She’s a good girl at the groomer but does not like her nails ground down; she much prefers them to be clipped. Having ears or feet handled does not bother her. Sadie was a perfect lady at the vet’s office. Sadie would do best in a home with a lot of room to run and activities to keep this sweet, smart girl engaged and occupied.